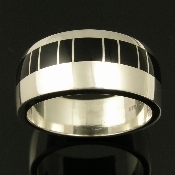 Hileman Silver Jewelry offers men's wedding rings in a variety of styles, widths and inlay materials. 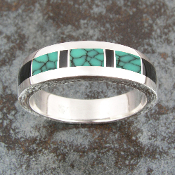 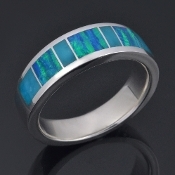 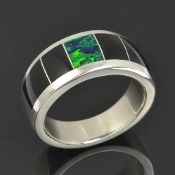 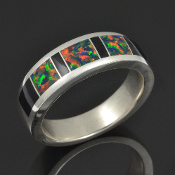 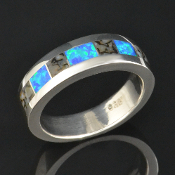 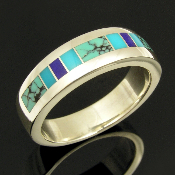 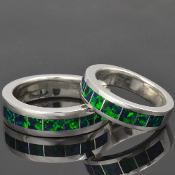 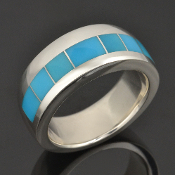 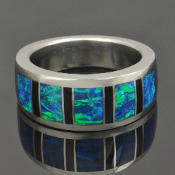 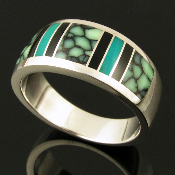 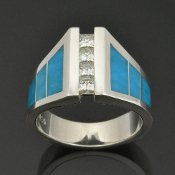 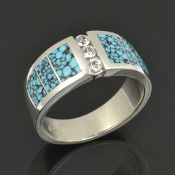 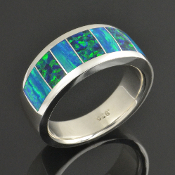 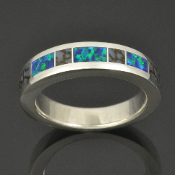 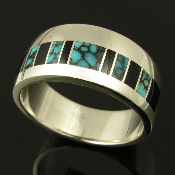 Our most popular men's wedding rings are often inlaid with dinosaur bone, turquoise, black onyx or lab created opal. 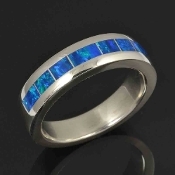 All of our wedding rings are handcrafted in your ring size in 4 to 6 weeks and may be customized by substituting inlay materials, gemstones, metals and inlay pattern arrangement. 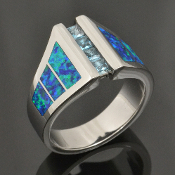 Some substitutions may be upgrades so contact us with your idea and ring size for details and a price quote. 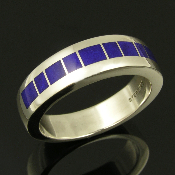 Awesome deep blue lapis inlaid in a sterling silver man's band by Mark Hileman. 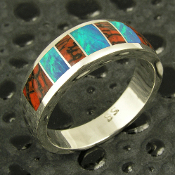 Ring measures 6.5mm wide and is a size 10 1/4. 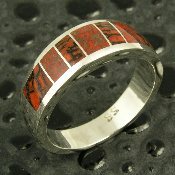 Available in other sizes by special order. 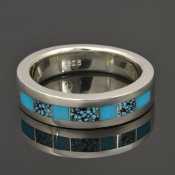 Spiderweb Turquoise and Turquoise Ring Silver man's band inlaid with dinosaur bone and black onyx. 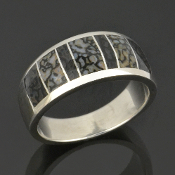 Man's sterling silver ring inlaid with black onyx. 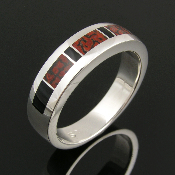 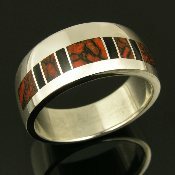 Handmade sterling silver man's band inlaid with black onyx by jewelry artist Mark Hileman. 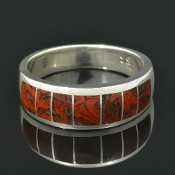 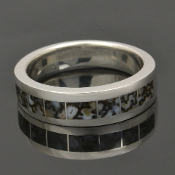 This contemporary silver onyx inlay ring would make a great alternative man's wedding band. 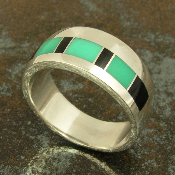 Handmade sterling silver band inlaid with green chrysoprase and black onyx. 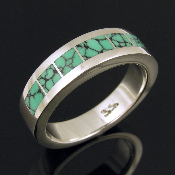 The 3 pieces of translucent chrysoprase appear to "glow" when you hold the ring in the sunlight. 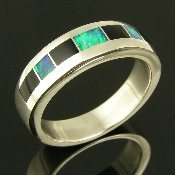 The ring is about 10mm wide and is a size 10+ or a snug 10 1/4. 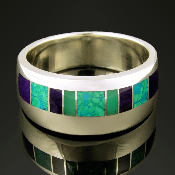 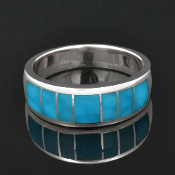 Unique man's sterling silver ring band inlaid with chrysocolla, sugilite and chrysoprase. 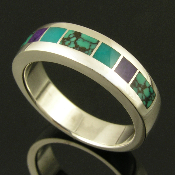 There are 4 pieces of inlaid purple sugilite and 2 pieces of green chrysoprase inlay. 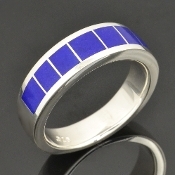 We recommend upgrading to Continuum silver if you are choosing silver for your wedding rings. 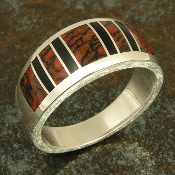 Continuum silver is much more durable than standard sterling silver and is tarnish resistant. 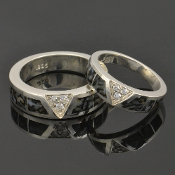 Read more about this great new metal option in our METAL UPGRADE section.